Posted in Desserts, Uncategorized, on April 11th, 2019. Wanna know what SMBC means? SMBC is Swiss Meringue Butter Cream. This is a post from Sara. Please note this recipe takes time but is not difficult. Sorry for the long delay in getting a blog post up here but I chose a ridiculously complicated dessert to be my first attempt on my own. What ever made me think I should post a cupcake that includes 3 separate recipes, I’ll never know. I’ve been baking since I was itty bitty and I’ve never found a chocolate cake this moist or a frosting so good. I’m never going back to a standard butter cream recipe. You know, the typical butter, powdered sugar and liquid. The SMBC is the lightest, fluffiest frosting I’ve ever worked with. As with all other frostings, you can color it and flavor it but it is best done without liquids. Colored gels and powdered flavors are best. The cake is a buttermilk recipe that is now my absolute go to favorite. I’m very new to Pinterest but found this website Livforcake.com. 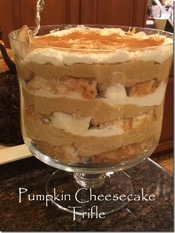 The blogger, Olivia, gave me the inspiration for this recipe. I actually used her buttermilk chocolate cake and her SMBC peanut butter recipe but added the surprise center filling on my own. The original cake recipe used oil and buttermilk but as I am watching my fat intake, I substituted low fat buttermilk and unsweetened applesauce. I’ve made the recipe both ways and the original recipe is excellent. It’s fluffy, moist and very intensely flavored. However, with the sweetness of the filling and frosting, I don’t mind the change. 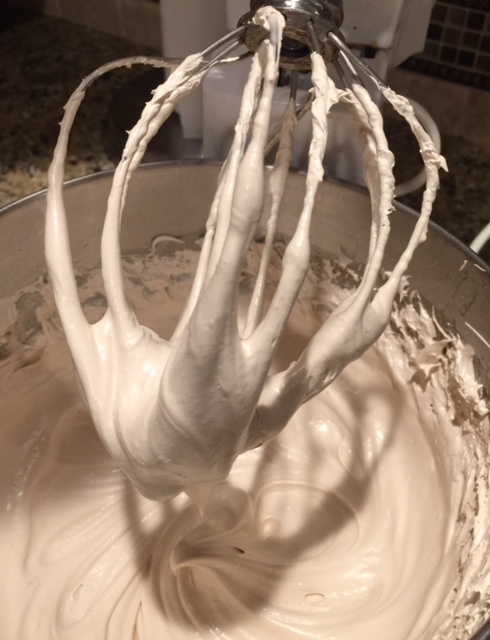 There is a real trick to making SMBC (Swiss Meringue Butter Cream). There is a tips blog page on Olivia’s website that I would mandate you read first if I could grab the link. So search SMBC on her website for “How to make swiss meringue buttercream”. The biggest and most important detail is to use metal utensils and bowls and to wipe them down with lemon juice or vinegar before using. 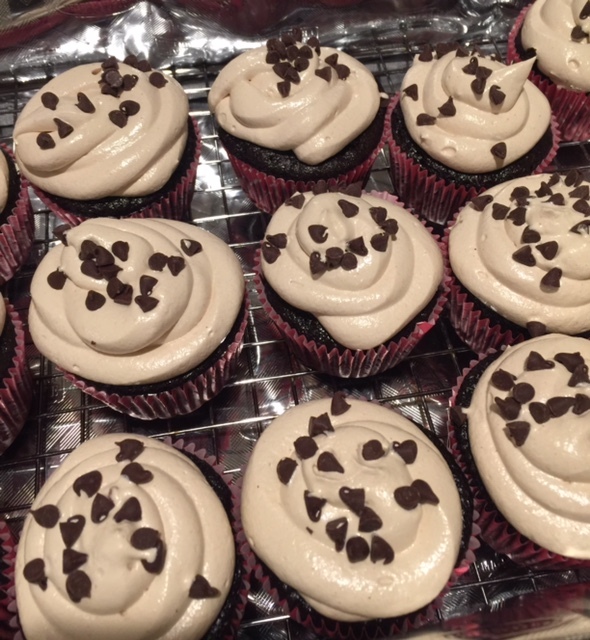 I have a thing for filled cupcakes so this has 3 recipes that make up the cupcake. If I could suggest, bake the cupcakes beforehand. Then scoop out the centers (keep for snacks later!) and make the peanut butter filling. Drop a ball into each cavity. Then make the frosting. Assemble and decorate. I made these for my niece and her soccer team. She shoots and she SCORES! Needless to say, they were a big hit. What’s GOOD: What’s not to like? These are moist, decadent cupcakes with a peanut butter surprise and intensely flavored peanut butter frosting. I love this cake recipe. I think it’s my new favorite. What’s NOT: If you haven’t made a meringue frosting before, it can be intimidating. As I said, read up on it first and DO NOT skip the acid wipe of your all metal utensils. I’ve made the SMBC twice now and haven’t had any problems. The recipe is time consuming, I admit. But I made the cupcakes Thursday night after work. Stored them in lidded containers. 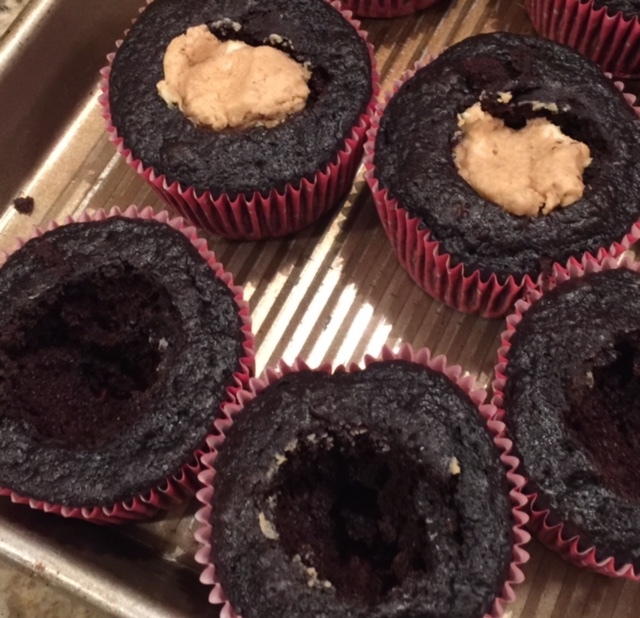 Then Friday after work, I scooped out the cupcakes, made the filling and dropped it in. It probably took me 30 mins to make the frosting. 1. Preheat oven to 350F, line cupcake pan with cupcake liners. 2. Place all dry ingredients into the bowl of a stand mixer fitted with a paddle attachment. Stir to combine. 4. Add wet ingredients to dry and mix on medium for 2-3 mins. Batter will be very thin. 5. Pour evenly into prepared cupcake trays. 6. Bake until a tester comes out mostly clean 18-22 mins. 7. Cool 10 mins in pans then turn out onto wire rack to cool completely. 8. CUPCAKES: scoop out center of cupcake to make room for filling, if using. 1. Stir together peanut butter and butter. 2. Gradually add sugar, stirring til combined. 3. Shape into balls. Place on wax paper and chill til needed. Per Serving: 55 Calories; 4g Fat (56.1% calories from fat); 1g Protein; 5g Carbohydrate; trace Dietary Fiber; 3mg Cholesterol; 34mg Sodium. 1. Place egg whites and dark brown sugar into the bowl of a stand mixer, whisk until combined. Ensure there is NO trace of egg yolk. 2. Place bowl over a hot water bath on the stove and whisk constantly until the mixture is hot and no longer grainy to the touch (approx. 3mins). Or registers 160F on a candy thermometer. 3. Place bowl on your stand mixer and whisk on med-high until the meringue is stiff and cooled (the bowl is no longer warm to the touch (approx. 5-10mins)). 4. Slowly add cubed butter and mix until smooth. It may look like it’s curdling at some point. Keep mixing until it comes together. 5. Add powdered peanut butter & vanilla and whip until smooth. Per Serving: 96 Calories; 0g Fat (0.0% calories from fat); 18g Protein; 3g Carbohydrate; 0g Dietary Fiber; 0mg Cholesterol; 274mg Sodium. Posted in Uncategorized, on December 31st, 2018. You know, I’ve been writing this blog for nearly 12 years. And as time has gone by, I’ve lengthened the interval between posts (at first it was every day, then every other, then every 3 days, and currently about every 4 days). With this diet I’m on, I don’t imagine you, my readers, have been all that interested in what I have to write. It takes a firm discipline to be on the Stephen Gundry, Plant Paradox diet. It’s restrictive, and isn’t a diet that you take on lightly, or even as a diet you’ll eventually get to the end of. It’s a life-long commitment, if you choose to continue. There are days when I’m quite frustrated with it, but I do believe in the basic premise of it – virtually no carbs. I’m experimenting with a few recipes to make “breads” that are edible on this diet, but are they satisfying? Not much, so far. I long for a slice of whole grain toast now and then, and a simple tuna sandwich slathered with some mayo and on white bread. Or a potato, or some kernels of corn in a soup. All no-no’s. My eating style has changed so much in the 9 months or so I’ve been on this diet. Currently I’m having 2 hard boiled eggs for breakfast, with a little mound of fresh blueberries on the side. For lunch I have soup, something I’ve made that contains foods I can eat. I have a small handful of nuts and a raw carrot in the mid-afternoon if I’m craving a snack. For dinner mostly I eat a salad with plenty of vegetables in it and tossed with a homemade dressing I’ve prepared. And at some point in the day I do indulge in some very dark chocolate (an ounce a day, which is allowed). That’s it. I can have a bit of wine if I want it, and I’ve been enjoying eggnog this month if it’s made with heavy cream. I do go out to eat some (with friends) and order meat and a veg mostly. Or a salad if they have one that’s got food I can eat. On occasion I still cook “regular” meals, with carbs. But they’re for guests. Usually very little of it that I can eat. And yes, it’s difficult doing that. I have so many wonderful recipes on my blog and I’m sad I can’t have most of them anymore. So, all that said, I’m giving myself permission to quit writing posts for the time being. Or at least not on the schedule I’ve been on. Or, unless I make something that I am really enamored with and feel a strong need to share with you. I’m not going away. My plan is to devote some of this extra time to my art, something I haven’t done in many years and I’d like to get back to it. Drawing and watercolor mostly. I’ll keep the blog up (it costs me about $12/month to keep it on the ‘net and an annual fee for the domain name). Maybe I’ll come back to it. I don’t know. 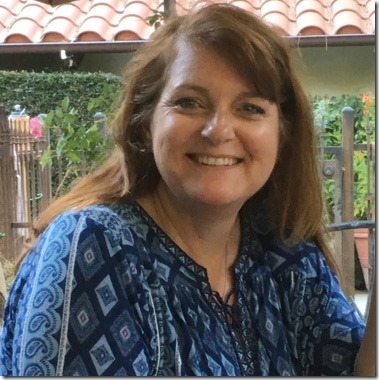 I’ve never accepted advertising, nor guest posts (other than my daughter’s). 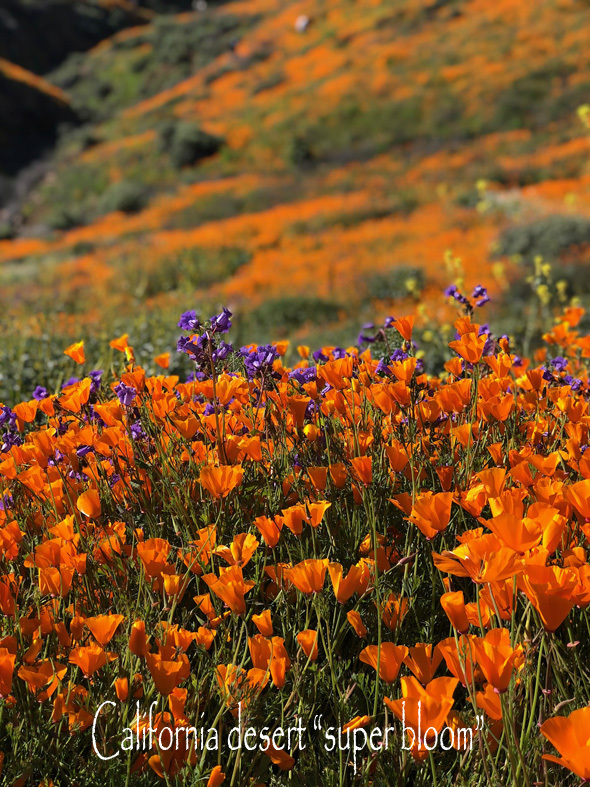 Daughter Sara would like to take over this blog, and perhaps she will – she says she want to. There’s a certain discipline that’s needed when you write a blog, and I’m not sure with her so-very-busy life (full time job and family) that she has the time. But she took photos of 2-3 recipes on December 24th, and she wants to share them. I need to teach her how to do it all, however, so the plan is that sometime in the next few weeks she’s going to come here to my house and I’ll spend time with her doing that. I’ve been retired since 1995 – gee whiz – that’s 23 years ago – and I’ve actually accomplished all of the goals I made for myself when I did so. (Those goals: 1. write a cookbook for my children [I started this blog first, but I did print a cookbook that I gifted to all of my kids and close friends]; 2. start an investment club [did that for 11 years, I think it was]; and 3. learn to paint [yes, did that one too]. I hadn’t planned on becoming a widow, however. At least not this soon. In March, it’ll be 5 years since Dave passed away. But I’m so grateful he and I did lots and lots of traveling in the years of our marriage and especially so after we both retired. We visited every place we’d put on our travel list and then some. I’m still living in a great big house, and I truly love my home, but there are days when I get overwhelmed with keeping watch over everything. In the last year I’ve had a leak – sprinklers that were spraying the house rather than the garden and it caused a $10,000 repair bill to replace hardwood flooring inside, dry wall, stucco outside, treat for subterranean termites, paint inside and out, etc. It was a big job and fortunately there was no mold. Currently I have a roof leak of unknown origin. Fortunately, during our heavy rains last month it only leaked onto my glass-topped coffee table (family room) and nowhere else. Now a big towel and a wide bowl sit smack-dab in the middle of that table all the time. Heaven forbid that we’d have a rain and I’d have forgotten to put the bowl on the table, so it’s safer to leave it there all the time. Next step is to contact a leak detection company and have them make a go of it. Recently I’ve subscribed to MasterCook’s online sync (currently $35.00/year), which gives me the ability to access all of my recipes from my phone because all the recipes that live on my kitchen computer as synced to the ones at the MasterCook website – those 4,000 recipes (and counting – I think yesterday I input about 12 recipes) I’ve input into the MasterCook program. Previously, if I was out, I could access only my blog to look up my recipes, but of course I couldn’t get to all the recipes I have in my to-try file. Now I can do that when I’m at the grocery store and forgot to bring the recipe with me, or forgot to make a shopping list. I use Alexa to add items to my shopping list, but sometimes I simply forget to do even that! I’ll keep my blog up and available for awhile. And maybe in a month or so I’ll miss it so much I’ll start back up again. You never know! But if you’ve ever planned to go back and look at older recipes and download them, you might want to do it. But for now, the blog will just “be there.” You’re welcome to email me with questions. Posted in Uncategorized, on August 12th, 2018. Without a doubt, the best photo I took on the whole trip. 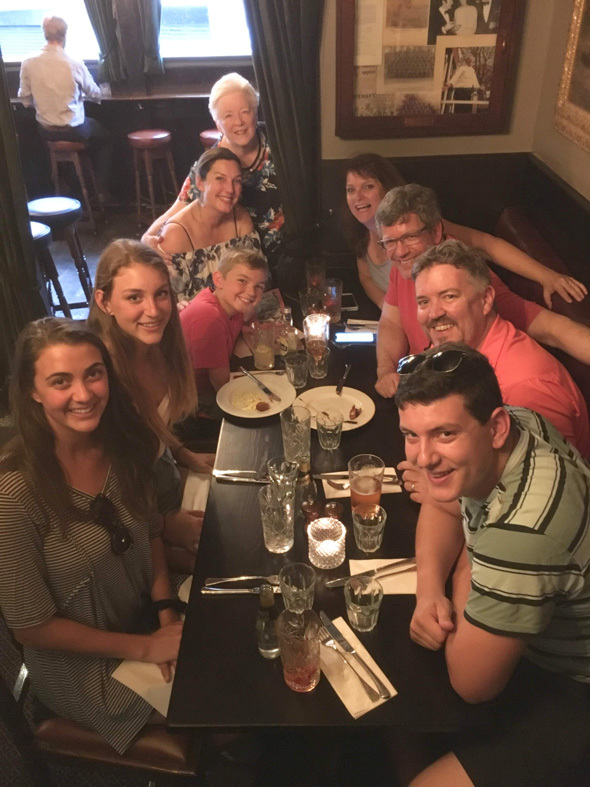 This trip my family took was 16 days – 3 nights in London, 4 nights in Florence, 4 nights in Paris, 3 nights in Normandy and the last night at an airport hotel. 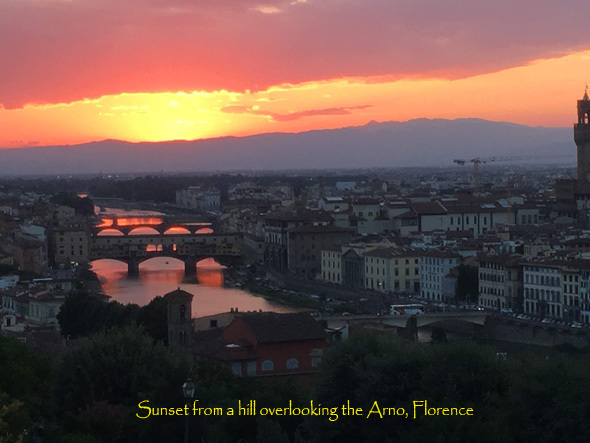 Our Airbnb adventure began in Florence, at an apartment just 30 steps from the Piazza Santa Croce. In hunting for a place, I knew about what area I wanted us to stay, and it was difficult, 10 months before the trip, to even find anything available to sleep 8 of us. As I mentioned earlier, however, the only reason (I believe) this apartment was available was because it was up 4 flights of stone steps without an elevator. We all got used to the climb (my grandson John carried my luggage up and down for me – bless him!). With my workout routine (cardio) I was able to walk up the full 4 flights without stopping – the first time each day – but each subsequent climb I’d usually have to pause at the 3rd floor for about 3 breaths, then continued on up. The apartment was wonderful – and the best part – it was air conditioned. Florence was HOT. Hot in temps and high in humidity. We all complained of the heat, but then, we asked for it by traveling to Europe in July. It got worse after we left (in fact, Europe has been experiencing a heat wave since we came home). I’ve been to Florence multiple times – and my choice always is to be out in the hills, the small towns, the countryside – but this was the first time there for some of them and there are so many things to see in Florence, so we needed to be in the hub of things. The closest grocery store was about 3/4 mile away, and Karen, Sara and I made the trek the first afternoon to stock up. We ate all our breakfasts at the apartment, drinking copious cups of coffee and filling ourselves with wonderful fruit, bread and cheeses. Plus some lovely salumi as well. You know, in Italy, the custom is bread without any salt – salt was an expensive commodity somewhere back in the dark ages, and the Italians simply got used to bread without it. We were able to buy baguettes too (also without salt) so we enjoyed those every day. The cheeses and salamis were my favorite. My family all had varying goals in mind – the Uffizi museum, the statue of David (by Michelangelo), the Galileo museum (a highlight for 10-year old Vaughan because of it’s interactive gadgets showcasing Galileo’s infinite scientific inventions), Fiesole (a hill town nearby the city), the Duomo, of course, gelato and more gelato. And pasta. I think the 3 children had pasta every day in one way or another. One of my goals was to eat at Il Latini, my favorite Florence restaurant. Karen’s uncle, who speaks a bit of Italian, was able to make a reservation for us weeks ahead (it’s a very popular restaurant) and we were whisked right in when the doors opened at 7:30. 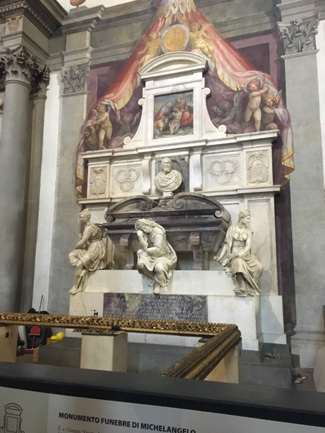 Another goal of mine was to visit Michelangelo’s tomb which is housed in the Santa Croce church. You have to pay to enter. 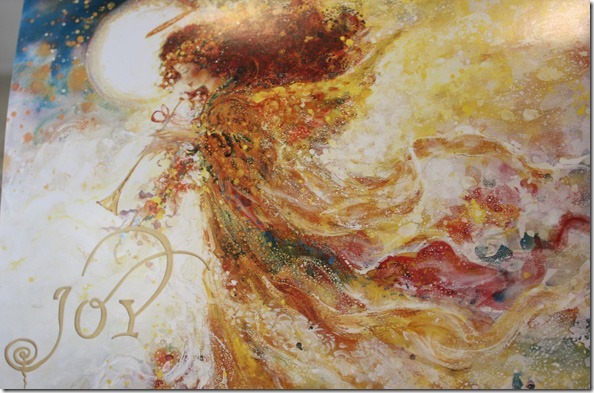 Back last year when I knew we were going to make this trip I sent my granddaughter Sabrina a copy of one of my favorite books of all time – The Agony and the Ecstasy: A Biographical Novel of Michelangelo by Irving Stone. I read it when I was in my 20s and have never forgotten it. Sabrina brought the book along on the trip, and since she’s an artist (she’s the granddaughter going to Clemson, who now says, she thinks, that she wants to go to med school, not vet school) she was really interested. After going to see the statue of David, she came flying into the apartment, arms outstretched, to hug me and thank me for the trip, but also the joy she felt at seeing the David statue. I didn’t go with them as I was standing guard at the apartment, hoping young John’s luggage was going to be delivered, but it was deadly hot that day and I remembered from before that there is simply no air in the building that houses the statue. I was thankful to be in the apartment, in the A/C, pleasantly reading. There’s the Michelangelo tomb, inside the Santa Croce church. You can’t walk up to it – they’ve constructed an ornate railing and there are engravings in the marble floor in front of it, so they don’t want the general public walking all over it. Many exhibits in Florence have English and Italian captions. One of the evenings we took taxis (two, obviously) to a hill on the south side of the Arno. It’s an open piazza, on a hilltop, and there were about 300-400 other tourists angling to get the best camera shot of the river, of Florence, of the Ponte Vecchio bridge (the one closest to the viewer) at sunset. And oh, that did not disappoint. I took about 30 photos. There was a collective sigh when the sun finally disappeared. Posted in Uncategorized, on August 9th, 2018. Our last night in London we got ourselves to a well recommended pub (I think it was called the Grenadier). I have no recollection what I ordered. In the foreground, where I was sitting, you’ll see a drink – we had it several times in London – strawberry gin. I’d never heard of it – Karen ordered it first, and then Sara did, then I did, then Sabrina did. It’s mixed usually with soda or tonic, and I must say, it was really refreshing. Sabrina bought a bottle at the airport as we left England; Karen did too. I didn’t think I would have room in my suitcase (actually I did, but just thought I’d wait until I got home) so yesterday I went to Total Wine and they carry Linton Hill strawberry gin. I’ll enjoy it this evening, I think. The other drink that we found was on many menus was Aperol Spritz. Aperol is an Italian apéritif made of gentian, rhubarb, and cinchona, among other ingredients. It’s not sweet in the least, and it’s mixed with soda water and sometimes not on ice, as many European drinks are. It was so hot in Europe that most of us adults enjoyed a cocktail before dinner to help us cool down. Obviously, Westminster Abbey. We had to wait in line for quite awhile. 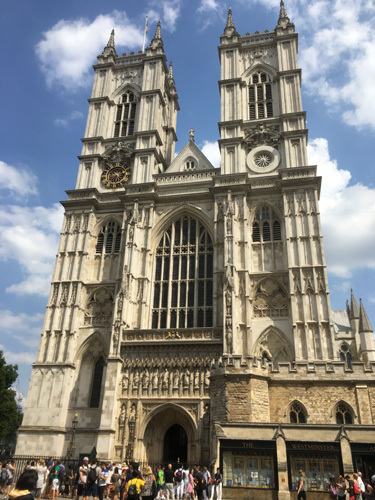 I’d told everyone that Westminster Abbey needed to be high on the must-visit list. All of the kids used the tube one evening they were “out,” but the adults weren’t so enamored with the thought of it (hot and very crowded), so our last day we taxied over to the Thames and stood in line for about an hour. Everyone was in a bit of awe over the tombs of several English kings and queens, and the Poet’s Corner. We probably spent about an hour walking around. Photography is no longer allowed in Westminster Abbey, so I have nothing to show for being inside. The next morning we got ourselves to London’s “City” airport (closer than Heathrow) and flew to Florence. Next post . . .
Posted in Uncategorized, on July 14th, 2018. We’re certainly not going into soup season, but I eat soup year ‘round. And this one is very satisfying if you like Mexican style cooking, this one is sort of a Tex-Mex. Where this recipe came from, I know not. I think it came from a Rachel Ray TV program some years ago. But since I evolved the recipe some, it’s no longer “original” anyway, so it’s my version, and what exactly made this Tex-Mex, I’m not sure. Maybe the chorizo? Or the seasonings in the meatballs? Well, never mind about that. It’s still a really good soup. Varying this was my way of sticking to my low-to-no carbs diet. What I eliminated from this recipe were bread and carrots – the crumbled up bread in the meatballs, and the carrots in the soup. And I substituted ground turkey for the chorizo, although I probably could have had chorizo; I just didn’t have any lean chorizo on hand. I like the chorizo at Whole Foods – it’s very lean and super-tasty. But I didn’t have any . . . and I forgot to garnish the bowl with a slice of lime. Oh well. Since I’ve been on this new eating regimen I’m trying to find more recipes that get in lots of vegetables and lean protein, but with tons of flavor. There are lots of herbs and spices in the meatballs, AND there are plenty of seasonings in the soup part as well. I’ve upped the volume of onions in the soup, and added some celery (likely not authentic) to give the soup more texture. And I added some diced avocado to the garnish. On this Gundry diet, avocado is beloved; we’re advised to eat at least a half of one a day. I don’t know about you, but it seems to me that for every 2 avocados I buy, at least one is rotten inside. My daughter Sara told me that she buys all her avocados at Costco and so far she’s had no throw-aways at all, but you have to buy a big bunch of them. Not sure I could eat them all before they’d go bad from over-ripening. What’s GOOD: what puts it on the really delicious scale for me is flavor. I liked all the garnishes, and the meatballs, made with some ground turkey, are very tasty. You CAN discern the little tiny speck of cinnamon in the meatballs – that adds a lovely nuance to them. Might seem odd, but worth adding! What’s NOT: nothing really – the laundry list of ingredients might seem daunting, but a lot of them are seasonings of one kind or another. This would even work for a weeknight dinner – making the meatballs does take some time, but they’re not all that fussy to do. 1. Place a large pan over medium-high heat with about 2 tablespoons of EVOO. Add onion, cumin, oregano, coriander, cinnamon, some salt and pepper to the pan and cook until the veggies are tender and spices are aromatic, 3-4 minutes. During last minute add the fresh garlic. Remove the skillet from the heat and let the veggies cool. Don’t wash the pan. 2. In a large mixing bowl, beat the egg with the cream. Add the cooled veggies to the bowl along with the ground beef and turkey, some salt and pepper. Combine the mixture with your hands and form into 1-inch balls. 3. For the sauce, in the same pot, heat over medium-high heat with 3 tablespoons EVOO. 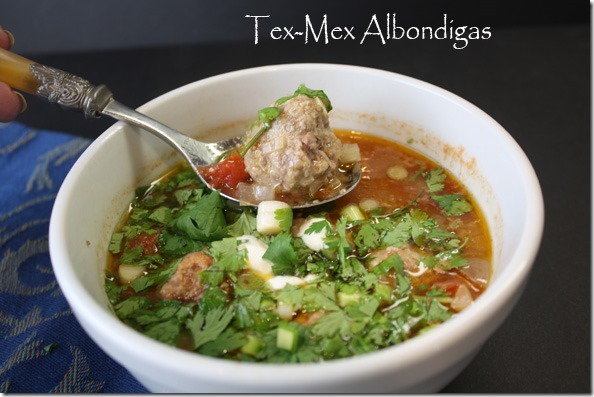 Add the chopped onion, carrots (if using) and jalapeno to the pan, and cook until tender, 5-6 minutes. Transfer about HALF of the mixture to a food processor and puree with the tomatoes. Return the mixture to the pot and add the chicken stock and chili powder. Bring up to a simmer and add in the meatballs. Reduce the heat to medium and simmer until the meatballs are cooked through, about 10 minutes. Per Serving: 656 Calories; 47g Fat (62.8% calories from fat); 39g Protein; 23g Carbohydrate; 5g Dietary Fiber; 169mg Cholesterol; 561mg Sodium. Posted in Uncategorized, on January 15th, 2018. Every year I give you a short list of Carolyn’s best (this year it’s 12) I posted during the previous year. 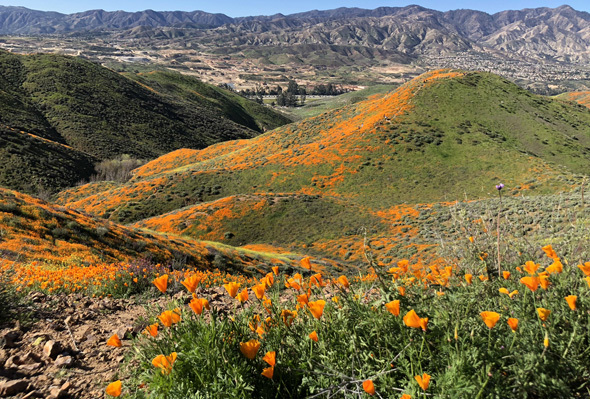 Click on the link if you’d like to go take a look again, or if you missed it the first time around! It’s interesting (to me anyway) to note that 2 of the 12 are sheetpan dinners! And one is a lowly, but elegant baked potato! A very elegant dessert, a Pumpkin Cheesecake Trifle made with angel food cake, pumpkin stuff and whipped cream. Lovely salad – for a special dinner, or could be an entrée salad: Goat Cheese Stuffed Mushrooms with Arugula. Roasted vegetables – oh gosh are these good – nothing more than bell peppers and onions with some Indian type spices (not hot). Worth making: Bell Pepper and Onion Roast. The first of the sheetpan dinners for the year – this one with chicken thighs and wedges of cabbage. Cabbage never tasted so good. Sheetpan Roasted Chicken and Cabbage. Did you think there could be such thing as a “perfect” baked potato? New techniques, but oh, so worth the effort. It may be the star of your dinner plate. 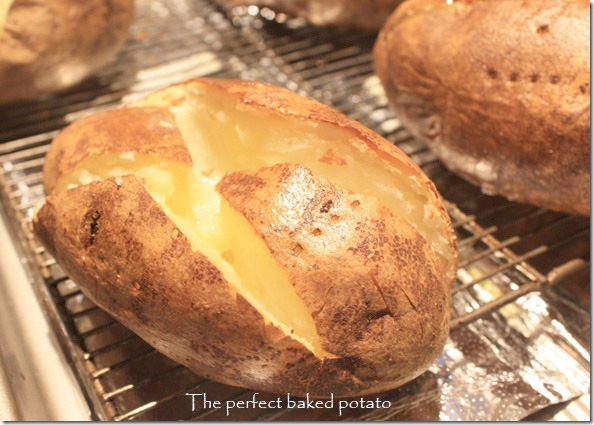 The Perfect Baked Potato. After I posted this my friend Joan’s husband Tom made it for himself – he liked it! The photo is kind of blah – but the dish is NOT! A salad, that sort of, kind of, tastes like potato salad, but made with saltine crackers. I took it to a potluck and many of the folks thought it WAS potato salad. A southern tradition. Georgia Cracker Salad. Scampi at its finest. Never had it so good. Done on the barbecue, believe it or not. Grilled Shrimp Scampi. A very tender applesauce cake to remember, made in a bundt pan and drizzled with icing. Oh so good. Applesauce Bundt Cake with Caramel Icing. A dessert so easy you just won’t believe it. Fresh raspberries and brown sugar made into a quick gratin. Raspberry Brown Sugar Gratin. A soup of green stuff, but enhanced with some Parm. SO very delicious and healthy. From my friend Darci who had never given it a name, so I call it Eat Your Greens Soup. The second of the sheetpan dinners. I made this twice and want to make it again. Soon. Sheetpan Chicken Dinner with Bacon and Sourdough Croutons. And last but not least, a so-flavorful mushroom soup, made with tons of umami flavor, but without a speck of milk or cream. And you won’t miss it. Mushroom Soup without Cream. Posted in Uncategorized, on December 24th, 2017. A beautiful, ethereal looking angel on a Christmas card I received this year. It was so pretty, I thought I’d share it. I hope you’re enjoying a lovely Christmas today. Posted in Uncategorized, on October 28th, 2017. Did I happen to mention in the midst of my termite tenting that I have a lot of NUTS in my freezer. Oh gracious. Maybe I’m part squirrel, because I’ve got a pound or two or three of nearly every imaginable nut in existence. I didn’t discard any of them, so am determined that I will not, I swear, buy any nuts for at least a year, unless I’ve run out. I use more walnuts and almonds than anything else, but I have plenty of those as well! 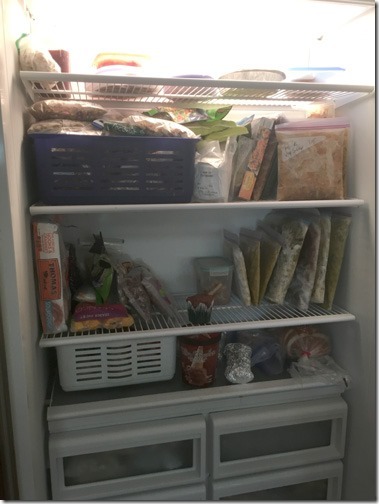 It may not mean much to many of you, but to look at my freezer now, pictured at left, it’s manageable. It’s not chock-a-block full. I actually have places where I can SEE the shelf. The white bin (bottom left) is full of nuts, as are 2 drawers down below. I had some soup the other day that I defrosted from 2015. Hmmm. It had a lot of freezer burn in it, so wasn’t one of my better ones. But just about everything else in there is worth keeping and I’m slowly winnowing away at the contents. I had the flu last week (guess it could have been worse had I not had a flu shot) and I dug into the soups for 2 meals once I was able to keep food down. I ate nothing for the first 24 hours except Sprite and sparkling cider. Also, ERRATA – if you copied or printed out the recipe for the Pan-Roasted Brined Pork Chops I posted early this week, there’s a typo in it. (Thanks to my reader/friend Donna who noticed the error.) The ingredient list calls for 2 cups apple cider – no, it’s 2 cups apple cider vinegar. I’ve corrected the recipe online, the pdf and the MasterCook file in case you want to re-enter it or download the corrected versions. AND, big news, my daughter Sara, has asked me if I’d like her to write some posts on my blog. I’m thrilled. There are umpteen recipes already here on my blog that are hers. She’s a very good cook, and she absolutely loves-loves to bake. Her two kids (Sabrina is the daughter who’s at Clemson University and young John is still at home, in high school still) are her greatest fans. Her husband (also John) is too, of course. She’s the best sports-team mom there is as she loves to bake goodies for all the kids. She brought two delicious items to a family get-together last weekend (a stunning cocktail with Prosecco in it, and a delicious, healthy appetizer) but she says she really wants to share HER recipe for chocolate chip cookies. She promises this weekend she’s going to spend some time writing up some things. Posted in Uncategorized, on October 11th, 2017. I’m thanking my lucky stars, and praising God that my home is intact. You may have read or seen clips on TV about the fires here in California. The Northern California fires have been far worse (homes, shopping centers and many people still missing and many lost) than our one here in Southern California, but devastating nonetheless. I was evacuated on Monday. They finally lifted it last night (Tuesday). I actually returned home late Monday night because I felt safe enough to return, although technically I was in a mandatory evacuation area. The road I used to get home wasn’t blocked off as many others were. 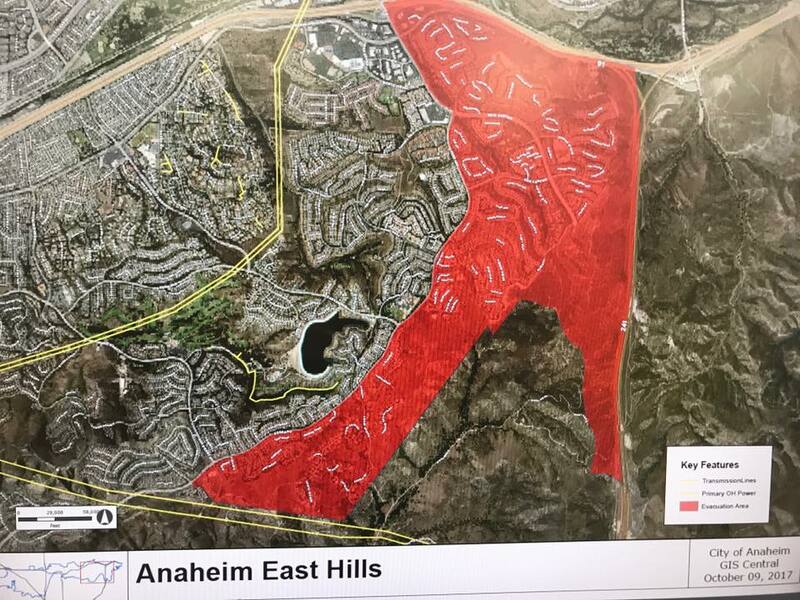 I live south of that red blob above and as the fires spread, destroying homes and stables and outbuildings in an area called Orange Park Acres, they extended the evacuation zone, and I was in it. I grabbed a few things: 3 of my paintings, some valuables, my kitty, some clothes, my favorite pillow, medications, passport, cat food, litter box, kitty’s favorite blanket and went to stay with my daughter-in-law’s sister and her husband, who live about 15 miles away, south and west, far from the smoke and raging fire. So, I lost more than a day in my quest to put away stuff from my termite tenting. I’m going to get on that today, I hope. But I’m feeling quite overwhelmed, actually with that task. And to make matters worse, my hot water heater that supplies hot water to my kitchen, has died. My plumber is going to install a small tankless one, but not until next week. Sigh. So I’m keeping my electric tea kettle going as I need to do dishes. Paper plates are the name of the game this week. Thankfully, I’m fine, and my house is fine. My kitty still feels a bit discombobulated, though, as he’s “off” his food a bit and wants more attention than usual. But we’re alive and well, all things considered.